FOR OUR PHOTO ALBUM OF THE EVENT CLICK HERE. 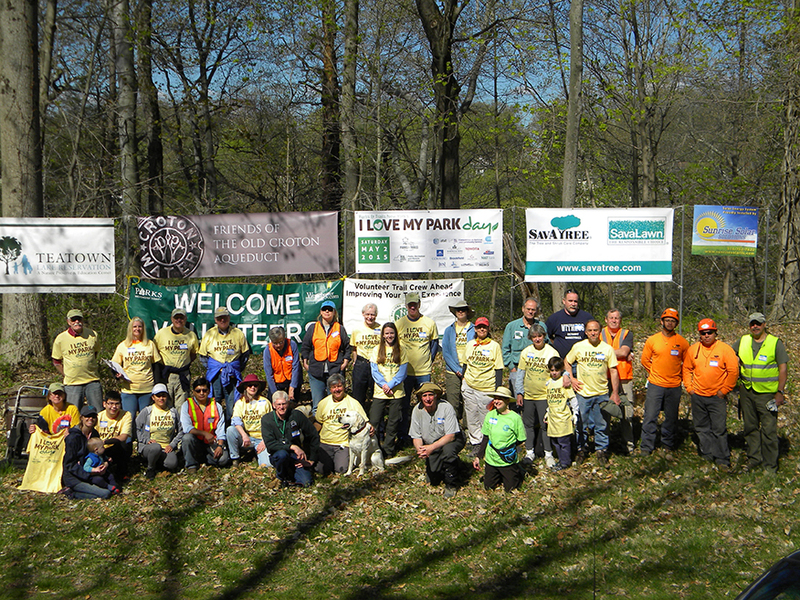 The Friends of the Old Croton Aqueduct congratulate and thank the 60 volunteers, community co-sponsors and corporate donors who worked together along with the Aqueduct State Park crew on May 2nd to make the fourth annual I Love My Park Day on the Old Croton Aqueduct trail outstanding, productive and very enjoyable neighborhood events. The Croton portion of the event’s participants included the Mayor of Croton on Hudson, Leo Wiegman. The volunteers bagged garlic mustard, removed many invasive plants and bushes, lopped tree strangling vines and cleared trash, all in a 2 mile stretch of the Aqueduct that intersects Quaker Bride Road in Ossining and Cortlandt north and south of the Unique Area. We also removed trash along the banks of the Croton River, branching out into the DEC managed Croton Gorge Unique Area. We restored some of the banks along the trail by planting native plants: a variety of ferns, wild geranium, partridge berry, witch hazel bushes and sweet spire bushes donated by Rosedale Nurseries, Inc. (http://www.rosedalenurseries.com) We would like to acknowledge the great work done by contributing corporate sponsor SavATree (www.savatree.com) which sent a certified arborist and two crew members, a significant monetary donation by Sunrise Solar Solutions, LLC (www.sunrisesolarllc.com.) and our collaborating sponsors, including Teatown Lake Reservation (www.teatown.org), the Bronx River Reservation Conservancy (www.vinecutter.com), as well as the New York New Jersey Trail Conference (www.nynjtc.org) all of which sent mentors and staff, and the Saw Mill River Audubon Society (sawmillriveraudubon.org) which also provided a mentor who set up a very educational display of invasive species along with take home literature. Local sponsors, Feed the Birds, The Black Cow Coffee Company (www.blackcow.com) & Run On Hudson Valley (www.runonhudsonvalley.com) and Mrs. Greens of Briarcliff contributed coffee, prizes for our lunch time prize drawing and refreshments. There was also an I Love My Park Day event in Hastings on Hudson that started in Zinsser Park and continued along the trail. The volunteers walked the Old Croton Aqueduct with local naturalist Haven Colgate and learned about the local flora and fauna and how to identify and remove invasive species. They specialized in removing many vines that were smothering trees and cleared an entire section atop Zinsser field between Edgars Lane and Minturn Street. They also engaged with many passersby about the issues of invasive plants and about the fascinating history of the Old Croton Aqueduct. Elisa Zazzera and Charlotte Fahn, local residents and board members of the Friends of the Old Croton Aqueduct provided the historical background. A great deal was accomplished during both events and the volunteers enjoyed the camaraderie for friends and neighbors as they improved the trail. The New York State Office of Parks, Recreation and Historic Preservation (OPHRP) in partnership Parks and Trails New York (PTNY) initiated the I Love My Parks Days events that took place throughout NY State this year. This was the fourth year of this now annual event and the fourth time the Friends of the Old Croton Aqueduct have hosted I Love My Park Days on the trail. We look forward to May 7, 2016!